Reporting on Donald Trump’s insane, violent, racist, ridiculous rhetoric is what created him, a new study suggests. He is only standing upright because he is crammed with so many think pieces. Although journalists play a political brokering role in presidential primaries, their decisions are driven by news values rather than political values. Journalists are attracted to the new, the unusual, the sensational—the type of story material that will catch and hold an audience’s attention. Trump fit that need as no other candidate in recent memory. Trump is arguably the first bona fide media-created presidential nominee. Although he subsequently tapped a political nerve, journalists fueled his launch. Trump’s coverage was worth millions in free exposure, and the study estimates he received $19 million more in ad-equivalent coverage than Jeb Bush, who was second runner up long before he was begging rally attendees to clap. Overall, they estimate that Trump’s coverage in CBS, Fox, the Los Angeles Times, NBC, The New York Times, USA Today, The Wall Street Journal, and The Washington Post was worth about $55 million. For her part, Clinton might have wished that the Democratic race received even less attention than it did, given that her coverage was the least favorable of the leading contenders, Democratic and Republican. Month after month...her coverage was more negative than positive... During the first half of the year, excluding neutral references, it averaged three to one negative statements over positive statements. Clinton’s negative coverage essentially equated to millions of dollars in attack ads against her, while Trump was lapping up “positive” attention. You may scream, “How is anything that’s ever said about Trump ‘positive?’” Consider his supporters. It’s a human centipede situation, as Anna Merlan wrote months ago. What accounts for Clinton’s negative coverage? One reason is the schizophrenic quality of journalists’ coverage of a “front-running” candidate. It is the story of a candidate with a solid lead, which is the main source of the candidate’s “good news.” There is, however, a less positive aspect to a frontrunner’s story... 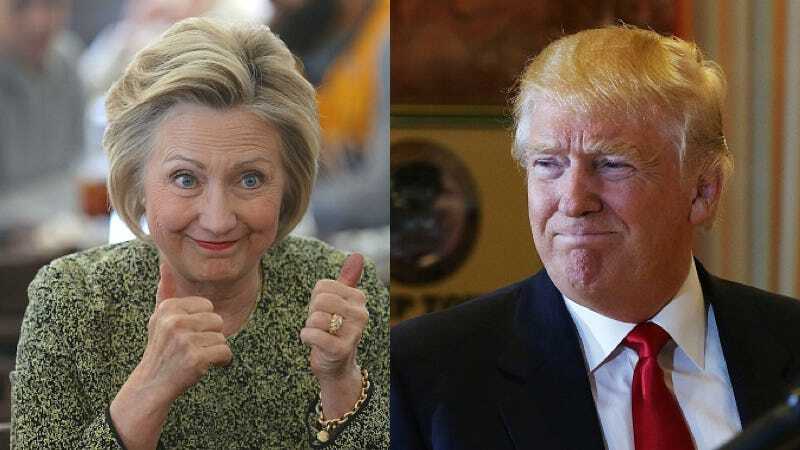 If the frontrunner loses support in the polls—a virtual certainty given the artificial boost that comes from high name recognition in the earliest polls—the narrative tilts negative. The candidate is slipping, which cries out for an explanation of one sort or another, which is always found in soft spots in the candidate’s character, message, or organization and not in the vagaries of polling. Oh well. Attack a man and he comes out stronger; attack a woman and she suffers for it. Here we are.